TheWoodHaven2 • View topic - Three phase: what's the story? Three phase: what's the story? There is a three phase supply on a pole about 8 or 10 metres from my workshop, on my neighbour's farmland. What is involved with bringing 3 phase into the workshop? Is it just a single armoured cable and some sort of consumer unit, or is there more to it than that? What happens to the lights and sockets that I want to be single phase? I'm told that the overhead cabling is 415 volts. Does that mean I need a transformer? Re: Three phase: what's the story? Mike G wrote: There is a three phase supply on a pole about 8 or 10 metres from my workshop, on my neighbour's farmland. What is involved with bringing 3 phase into the workshop? Is it just a single armoured cable and some sort of consumer unit, or is there more to it than that? 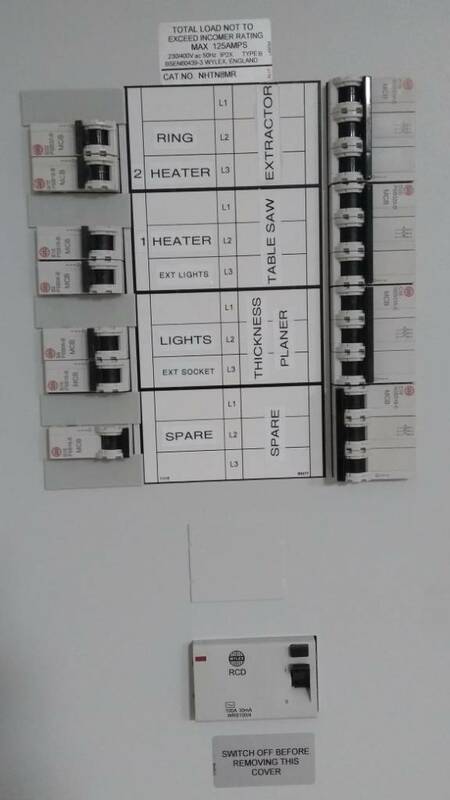 What happens to the lights and sockets that I want to be single phase? I'm told that the overhead cabling is 415 volts. Does that mean I need a transformer? Mike, I'm on the wrong continent, but let me be the first to say "You lucky dog", and yes you'll need a transformer. If I could get 3ph from the pole I could get rid of my phase converter and most of my VFD's. Beyond that, I'm sure you'll need some kind of service box that will feed your existing consumer unit (what we call a breaker box) with two wires of the 3ph to give you single phase service. Others will no doubt chime in with specifics. No, you don't need any transformers. If you connect a pair of wires between neutral and one of the phases you will get 230v. My one concern is the statement that 'the overhead cabling is 415 v'. This means that the transformer converting high-voltage 11kv or 22 kv 3-phase incoming from the electricity supplier's distribution cable down to the 415v three-phase mains cable is somewhere (probably up a pole). Do you know where each end of the overhead cable is located and what they are connected to? Is the person who told you that it is 415v sure of this ? This cable could be fed from AFTER the farm's meter in which case you'd have some tricky negotiating to do with the farmer re billing your consumption. You also have to balance the load on the three phases but a spark should be able to advise you on that and everything else. Last edited by old on 04 Sep 2017, 16:11, edited 1 time in total. You first port of call will be to call POWERGRID or whoever owns the supply line. I filled in a request via Northern Powergrid's website, it was quite easy. They'll contact you with an estimate, (usually quite under!) then provide a final quote to book in. They'll come out and connect a supply cable and install a 3 phase cutout (the bulky fuses 80-100A) to the closest point/ meter cabinet on your property (they choose location, usually) You then contact an energy supplier (Sainsbury's, British Gas, etc, etc) to install a meter (FOC) so you can be billed and have something to connect to. 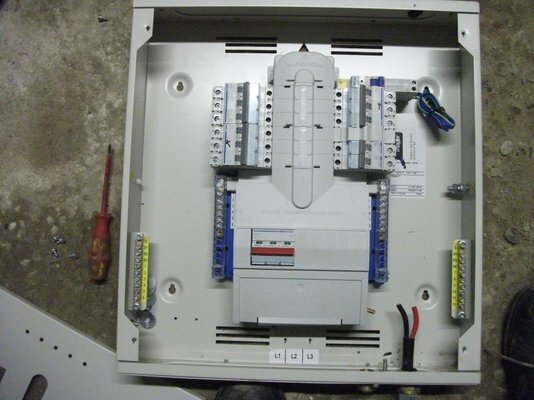 Now you and your sparky are ready to connect a consumer unit/ distribution panel to the meter. If the meter is away from the workshop (e.g. 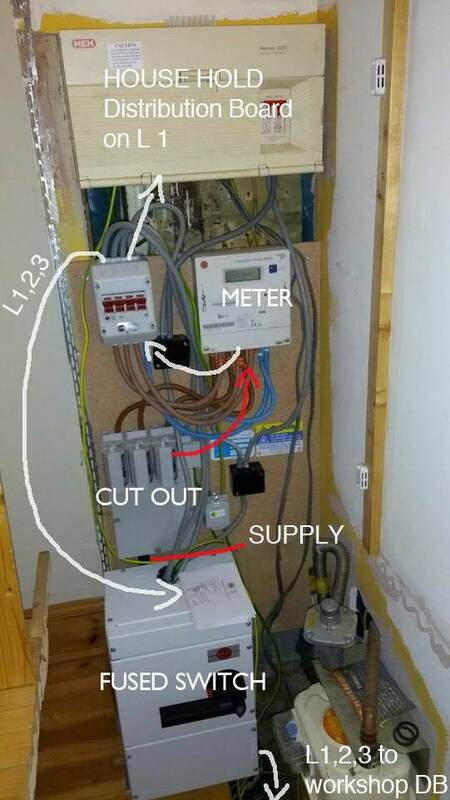 lets say a box on the boundary of your property) then your sparky would install a fused switch (box with an isolation kill lever/switch) here and you would run some 4 core SWA with an separate EARTH to the workshop and distribution panel. With the diameter of the cable being based on distance run. Mine is 25mm as it's running 50meters (voltage drop). I'm not sure if the fused switch is mandatory, your sparky would know, It does protect the 3 cut out fuses. In your workshop distribution box you'll have 3 phases L1, L2, L3. All your single phase domestic style supplies (lights, ring, heaters,) will tap into any ONE of these. Your 3 phase machines will use all three. In my case my 3 phase 'cut-out' also supplies the house ....my house connects to L1....my workshop lights and ring are on, L2 & L3, and my workshop machines are on all three L1,L2 & L3. This is so the supply is balanced. A good sparky should ask about all the things you are planning on running and calculate this for you. It cost me £3000 to have 3 phase run 7m across the road and a cut out installed on my property (which is right next to the pavement). Any works on your property have to be prepared by yourself before. The requirements are usually explained before hand. (Roger...who is a bit mithered at the moment as the incoming voltage is 240v as opposed to my transformer tweaked 255v on a good day.). There was a major power cut yesterday evening and I'm hoping that it's a result of that and only temporary. Thanks Jim. Great post, and a really useful explanation. Here's a post support (rough) diagram. Think it has all been explained and I've only skim read all of the above. Between each pair lines is 415V but each individual line is 240V above earth. The higher voltage between 2 lines comes from them being out of phase by 120 degrees. You don't want to wire between live and earth so you have a neutral wire instead for 240V. I think the neutral is bonded to earth back at source. At the house it can be a couple of volts above earth due to voltage drop in the neutral return. Is the supply shown on the fifth picture on page 2 of your workshop thread ? If so, it looks like a high voltage line which will feed a transformer on the grid. You would need a supply from the low voltage side of the transformer. The power company might be able to fit a transformer on the pole, which may need replacing if it isn't strong enough to carry the additional weight. I assume that you would have to pay all their costs. If there is a three phase low voltage distribution in the road (overhead ?) it might be cheaper to have a supply installed in the house and feed it from there to the workshop. Talk to the supplier to see what is possible. If all else fails, you could install an inverter. Yep, that's right. That pole is just a few metres from the workshop. I'll enquire with National grid and see what's what. Mike G wrote: Yep, that's right. That pole is just a few metres from the workshop. I'll enquire with National grid and see what's what. Yeah, I knew that.... I know a UKPN employee locally who would do this in his spare time for vastly less than going through the normal channels.......if the paperwork is OK, which it won't be. Mike G wrote: Yeah, I knew that.... I know a UKPN employee locally who would do this in his spare time for vastly less than going through the normal channels.......if the paperwork is OK, which it won't be. Not a chance. You're looking at a disconnection of service to 'x' properties or a 'hot glove' team. Robert wrote: You don't want to wire between live and earth so you have a neutral wire instead for 240V. Both "L" and "N" are likely to be live! I'm sure all contributors to this topic understand these terms, but casual readers may not, and use of the terms Live and Neutral together may imply that only one of them is likely to bite! Of course, those that don't know what they're doing should not play with electricity, but the reality is that we all like to learn how to do things and have a go ourselves.